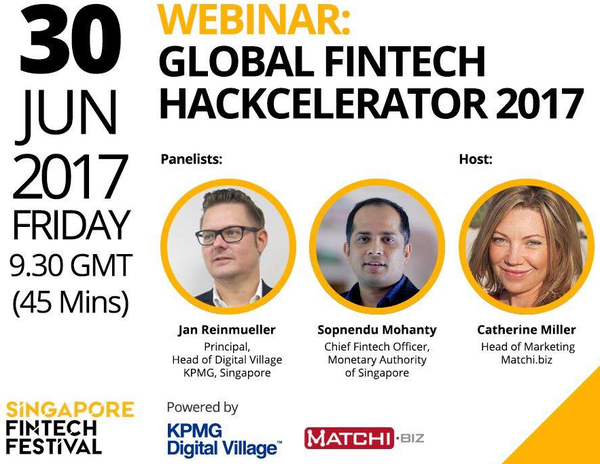 [Global Fintech Hackelerator 2017] The Global FinTech Hackcelerator is looking for the most innovative start-ups from across the globe who can address problem statements contributed by the global FinTech community and the financial services industry. We invite you to join us for an online discussion with MAS, KPMG and Matchi. Holistic financial planning - What are your assets & liabilities? Banking for the unbanked - For the invisible, transients, migrant workers etc. Collateral risk management - How can banks reduce collateral risk? Automated bookkeeping - How to assign every transaction a UID? Trade finance authentication - Authenticate invoices, inventory etc.